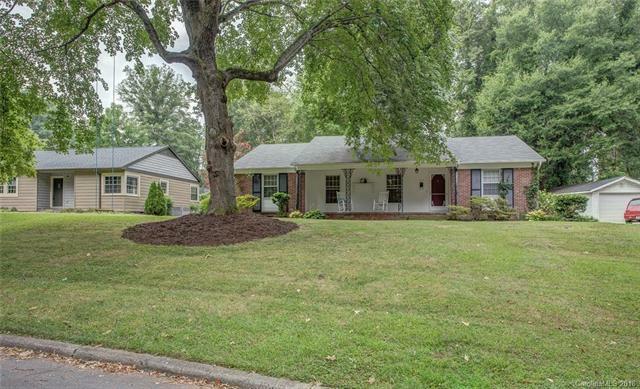 Super nice brick ranch with a beautiful setting overlooking wooded area in one of Gastonia's older classic neighborhoods. Lots of living space with many updates and improvements that include new HVAC 2017, Roof 2015 and remodeled kitchen with granite counters & tile backsplash. Both living room and den have fireplaces. Some original hardwood floors along with laminate wood run throughout the home, and a bit of retro character remains giving this home personality! You'll love the sunroom and large laundry/utility room. Great storage space in attic, plus outdoor storage bldg. Come rock on the front porch and enjoy the outdoors!